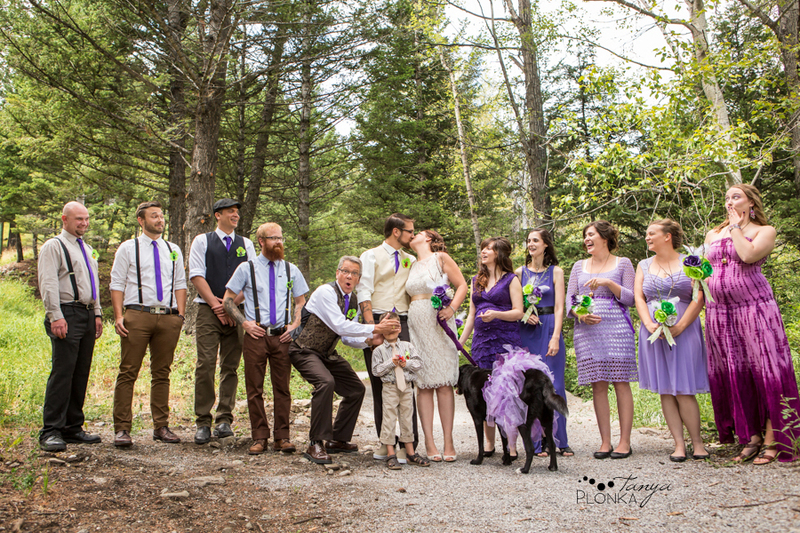 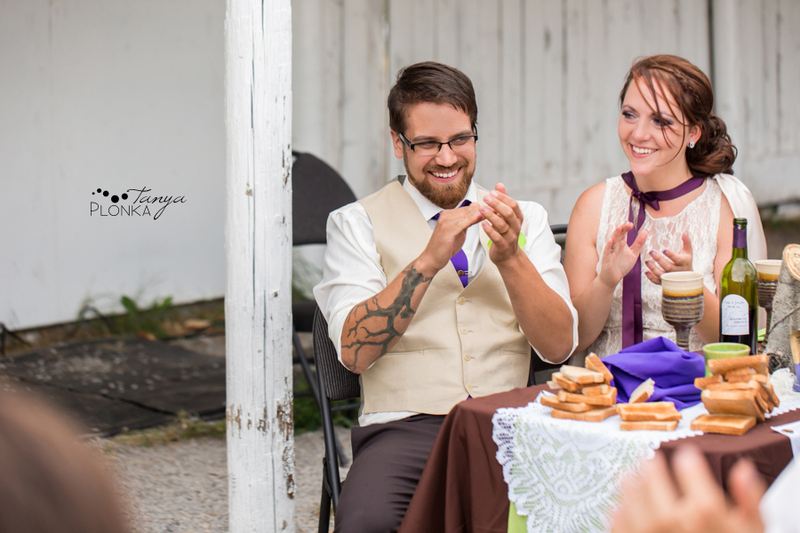 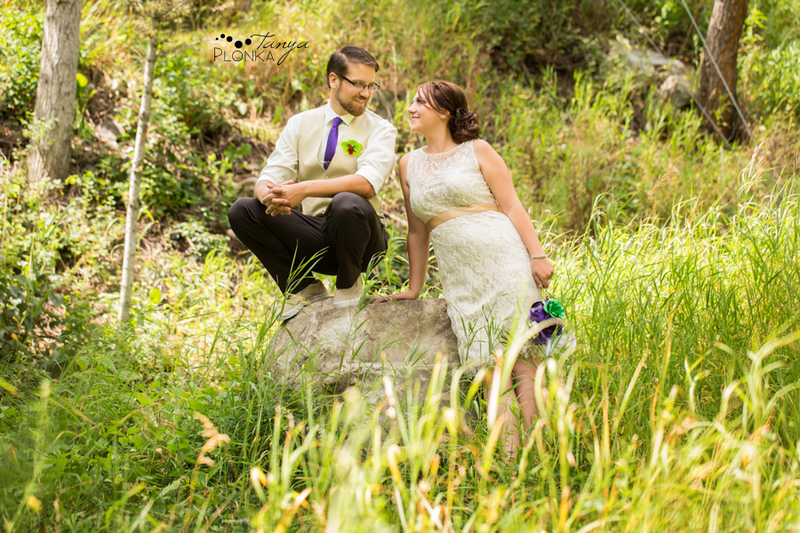 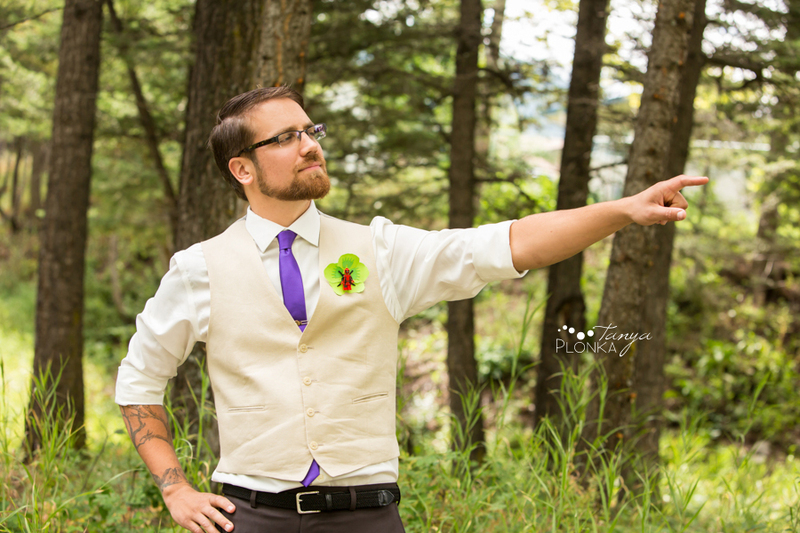 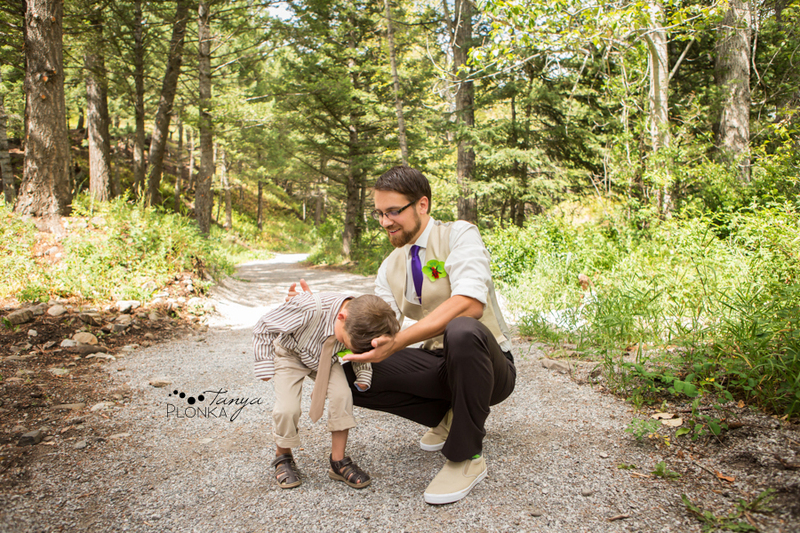 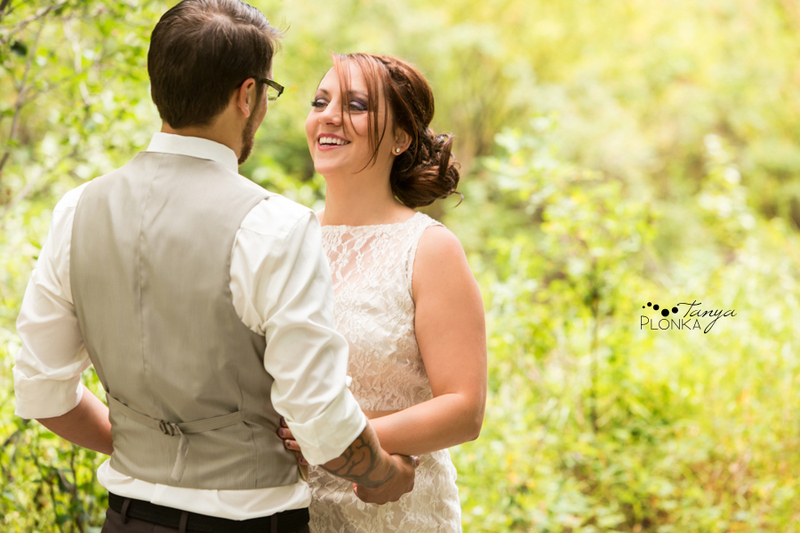 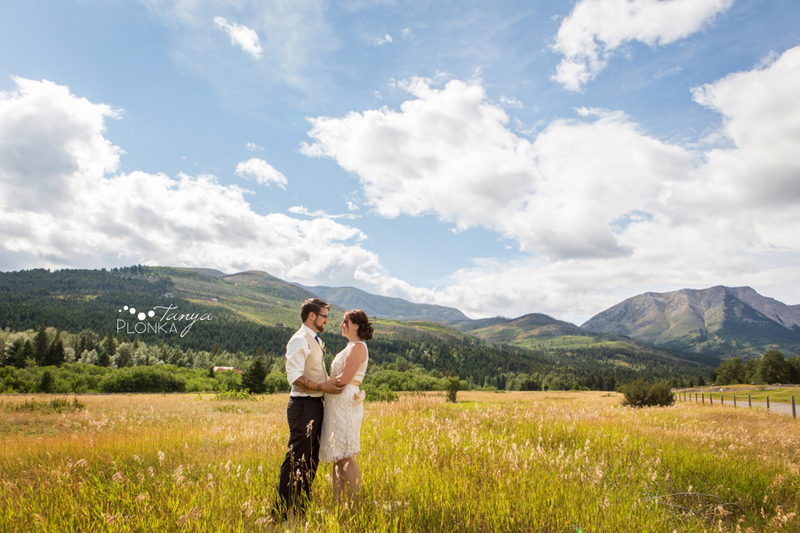 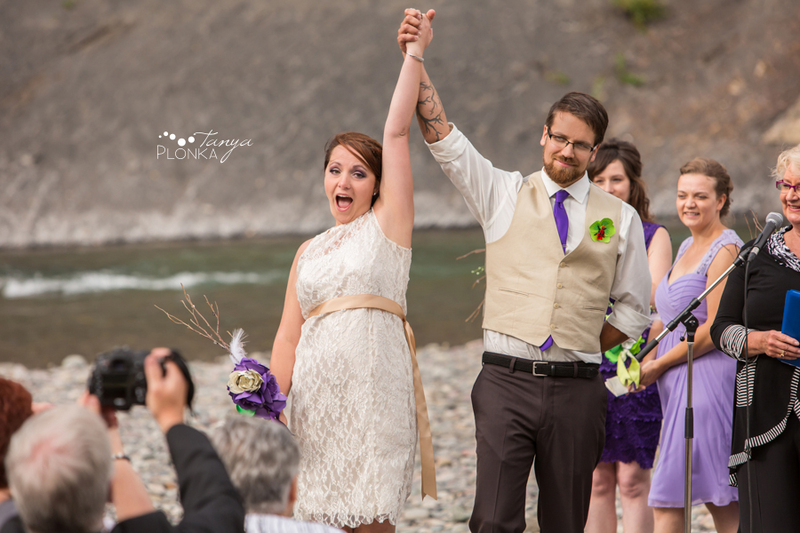 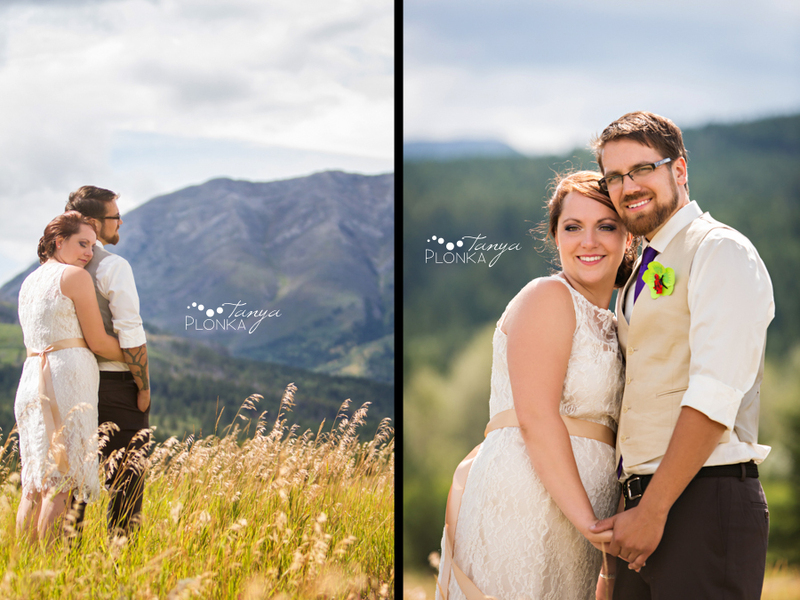 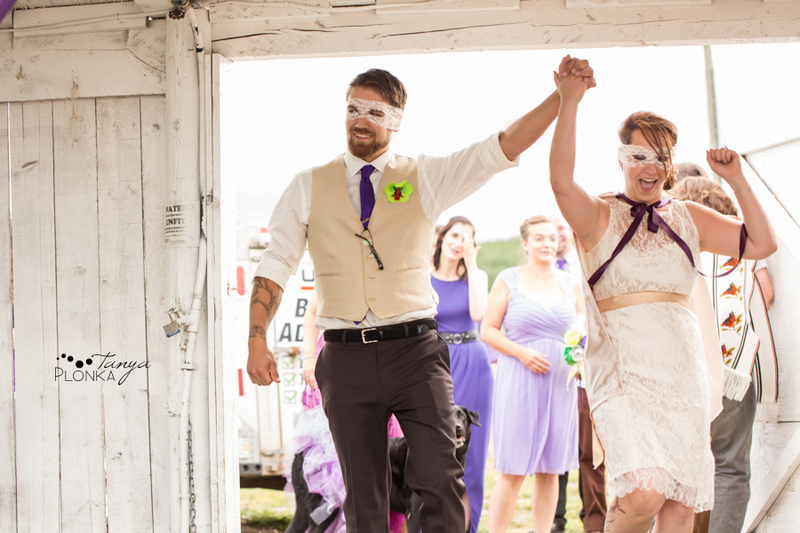 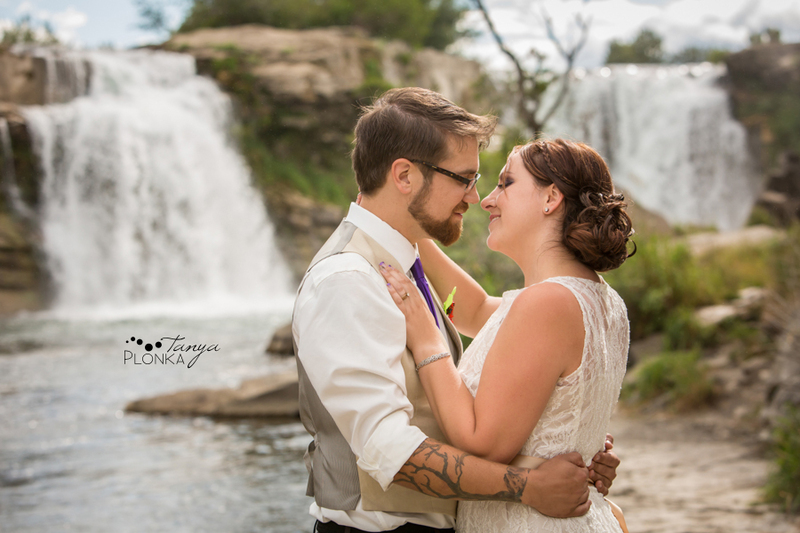 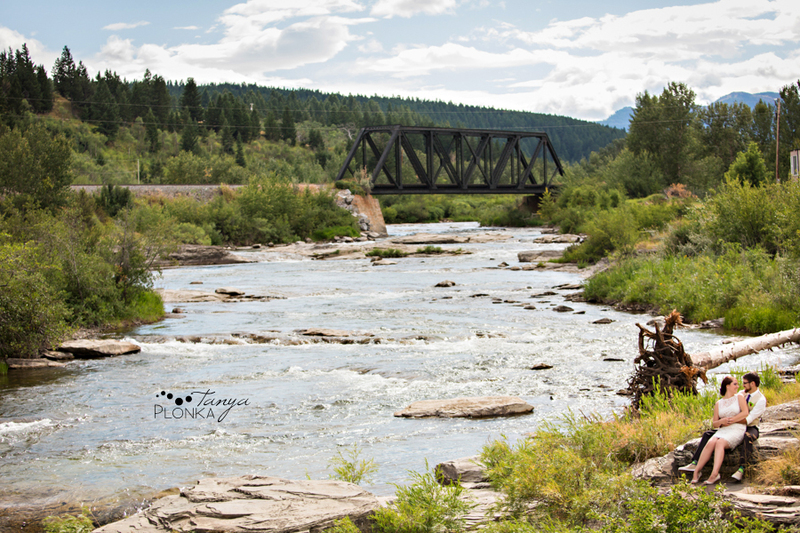 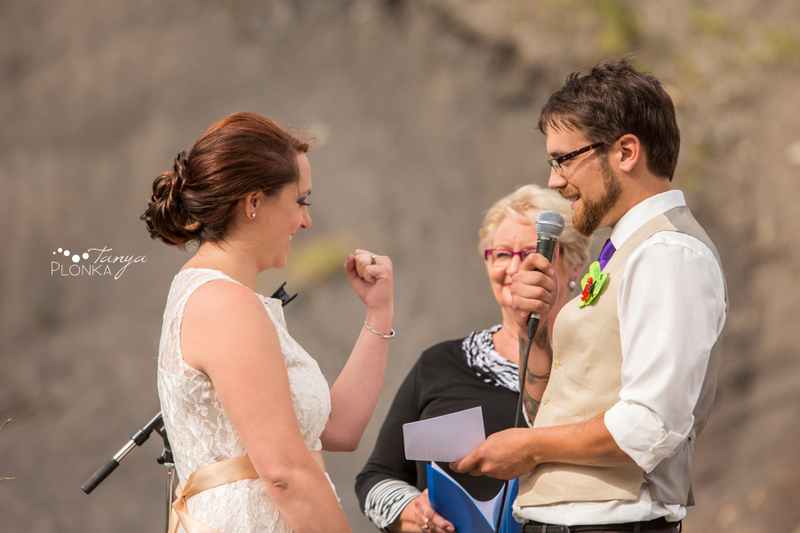 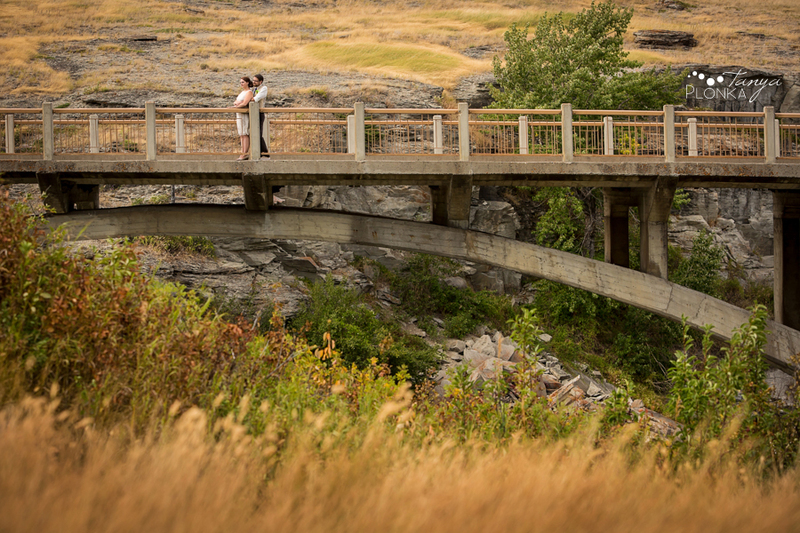 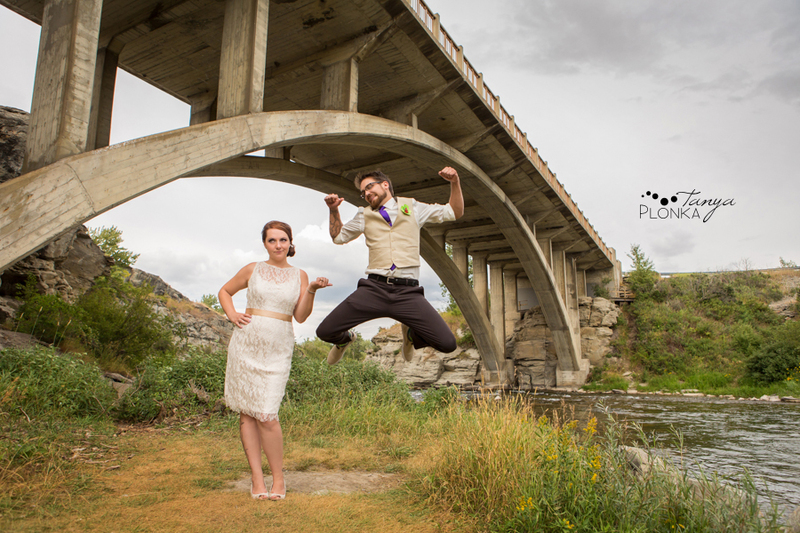 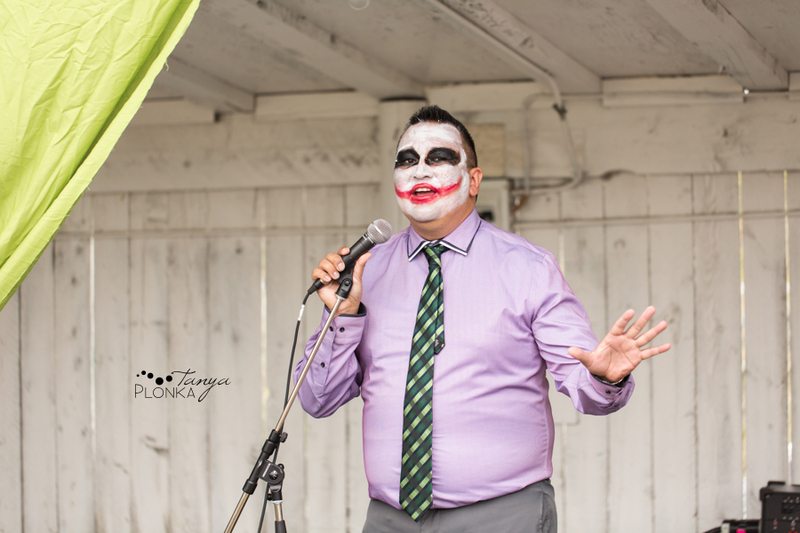 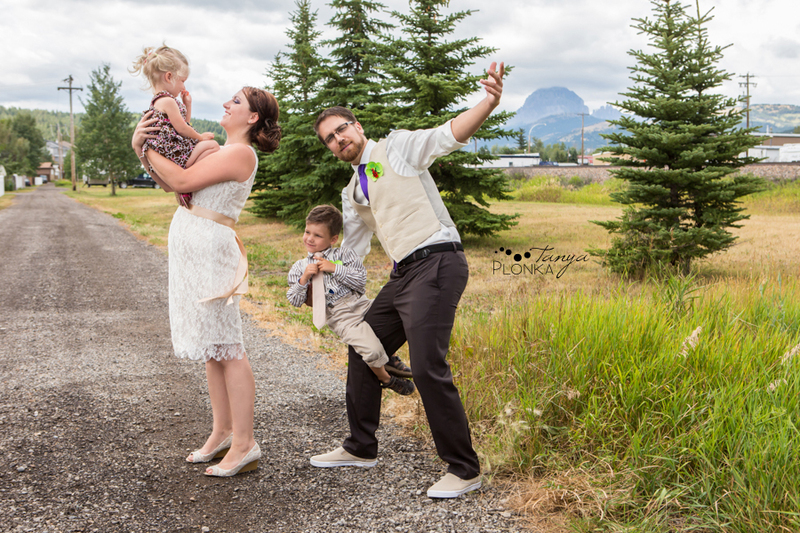 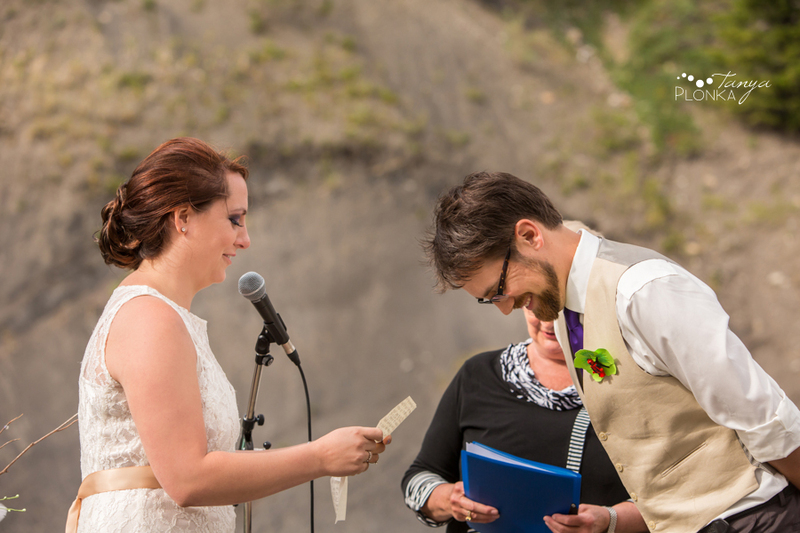 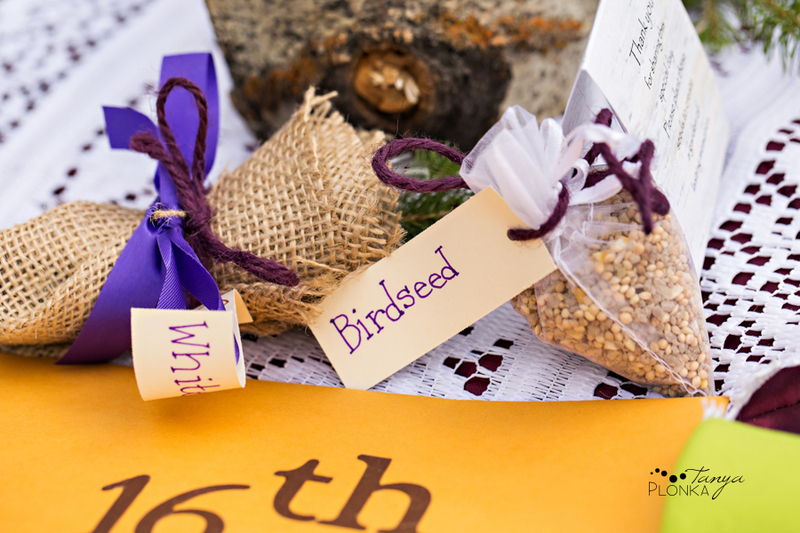 Tricia and Colin held their Castle River summer wedding in the Crowsnest Pass area, starting in Coleman where Tricia grew up and working their way over to the Lundbreck area for the ceremony and reception later in the day. 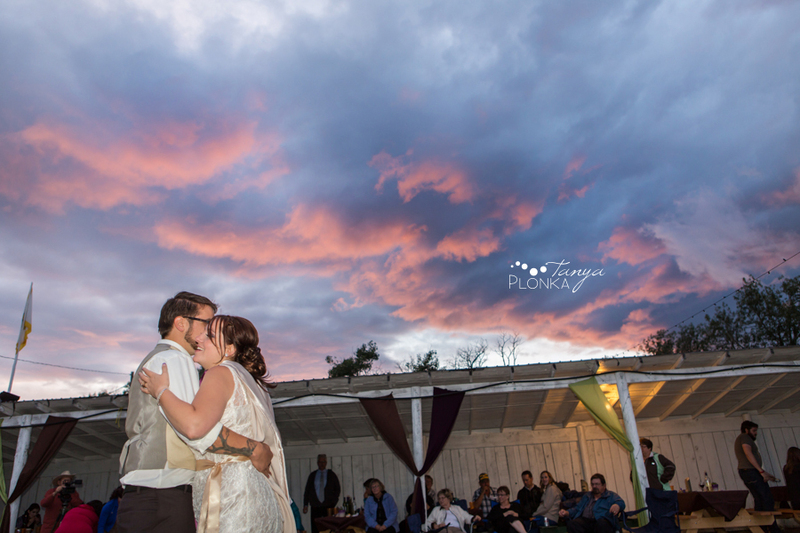 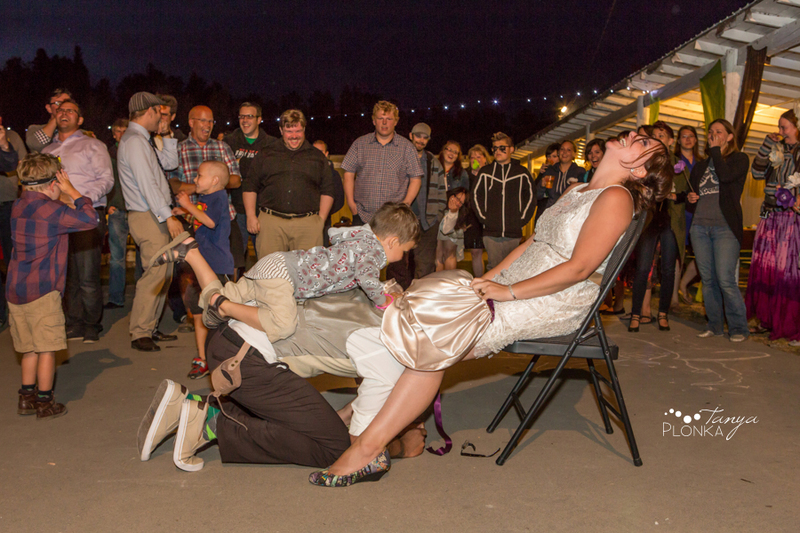 The Castle River Rodeo grounds were a beautiful location to hold their celebration, from their river side ceremony to their starlit open sky reception. 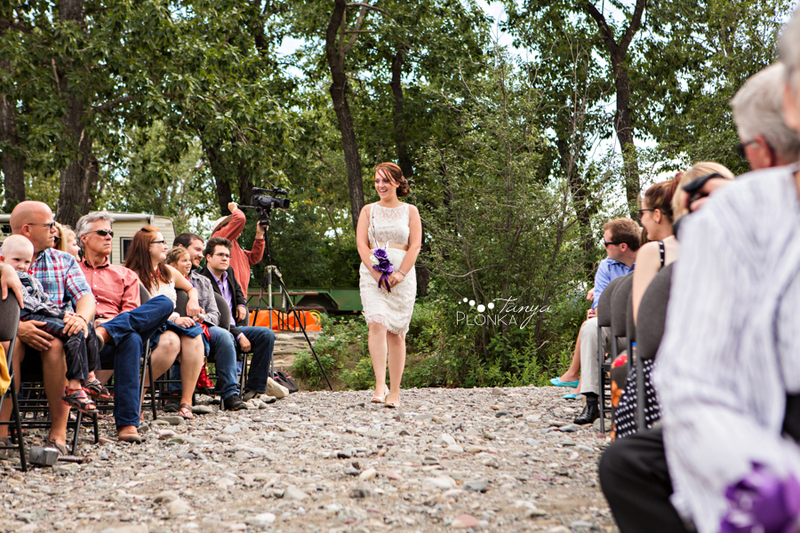 Our friend Andrea at Elegant Weddings and Events (who was also in the wedding party!) 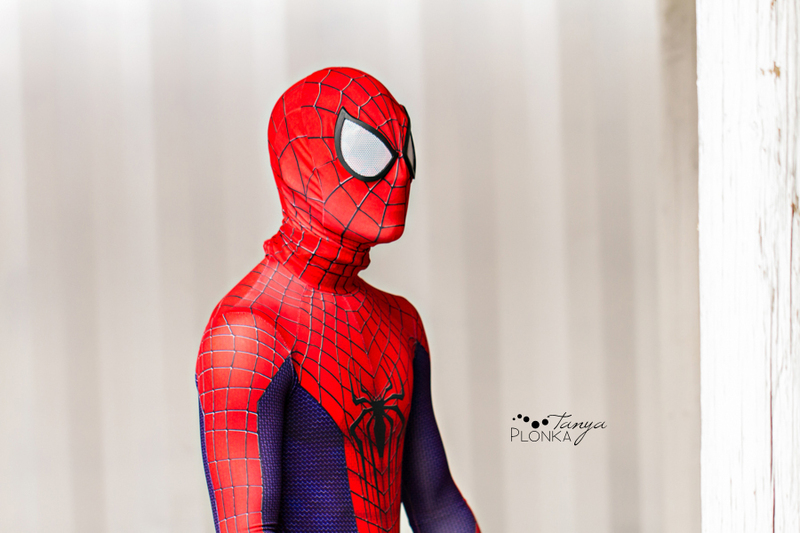 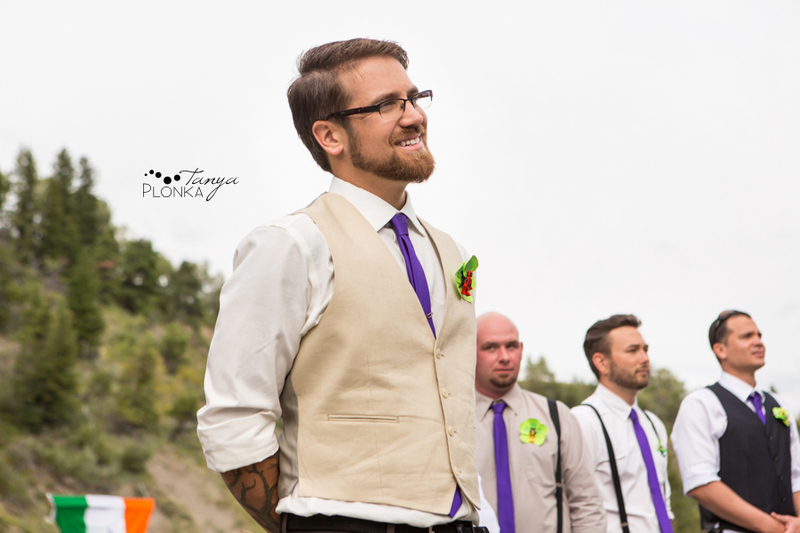 did an amazing job coordinating the whole event. 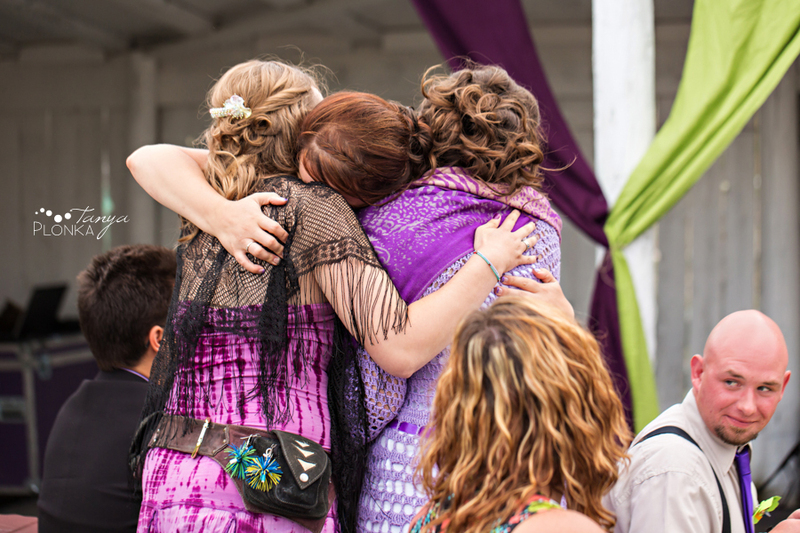 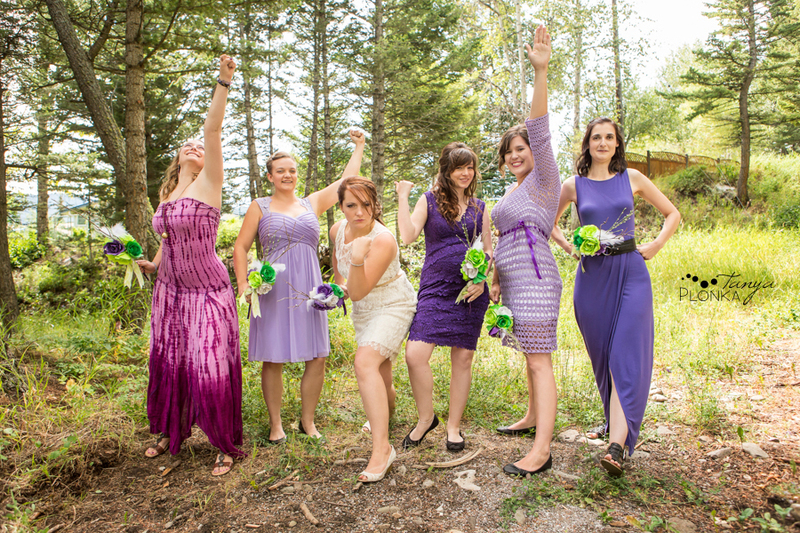 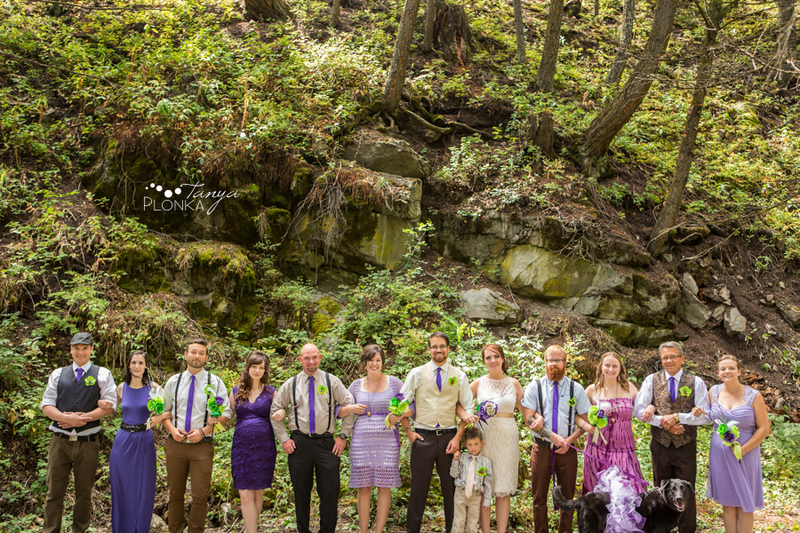 All of the bouquets were handmade out of paper, and Tricia’s dress was sewn by a friend. 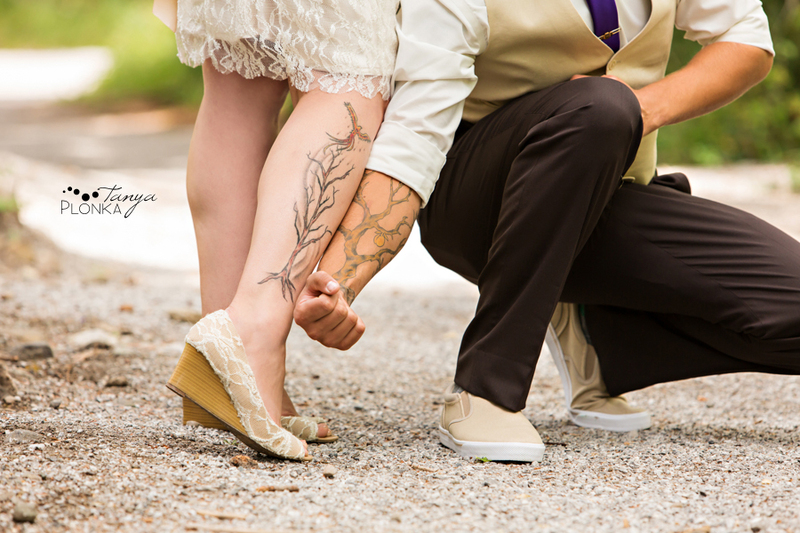 Though their tattoos are from different pieces of fantasy fiction, they go together so well! 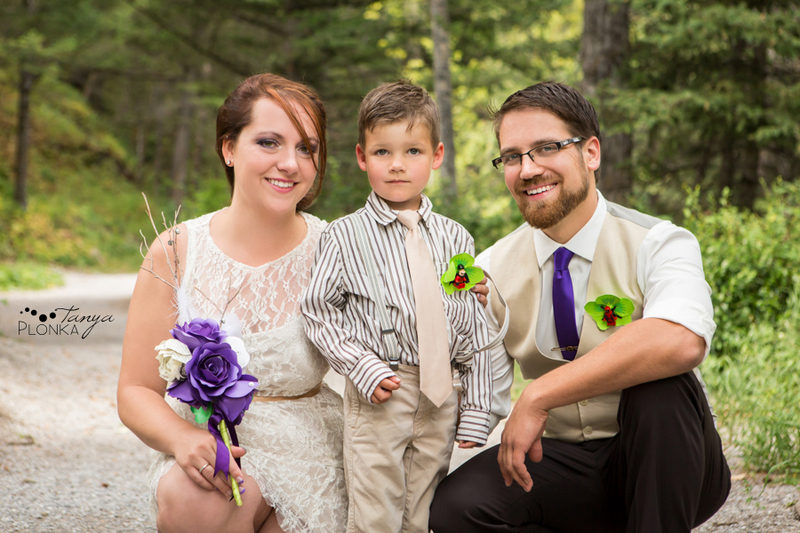 Colin’s nephew was their ring bearer. 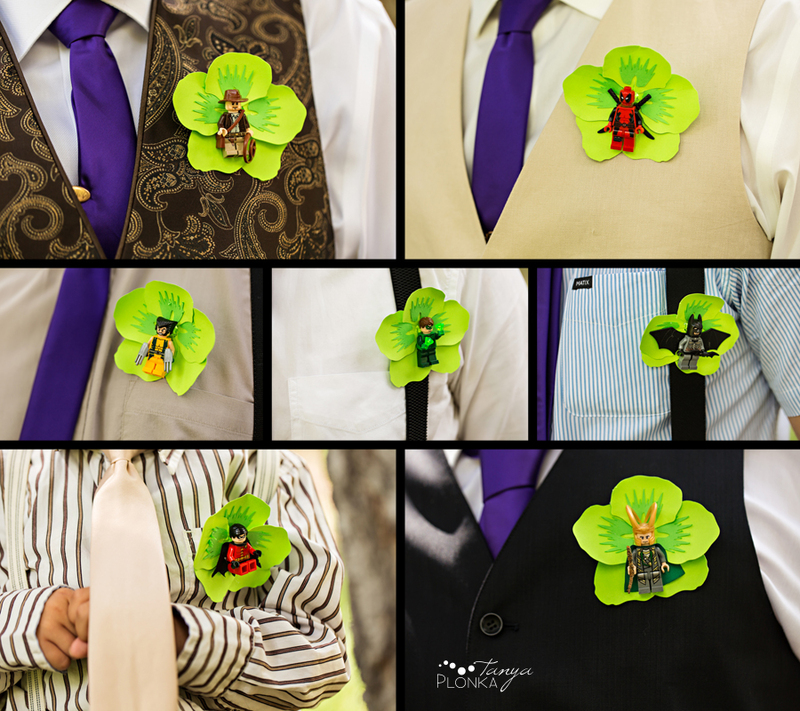 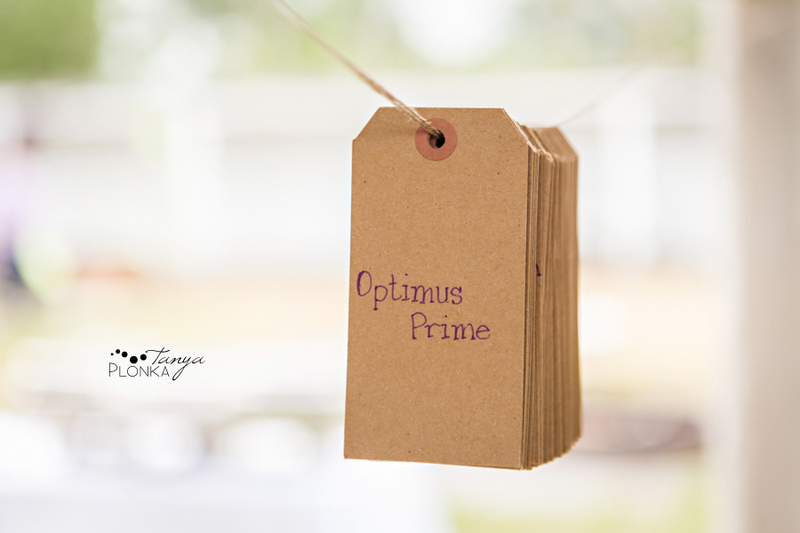 The guys also had custom made paper flowers, but incorporated Lego superheros. 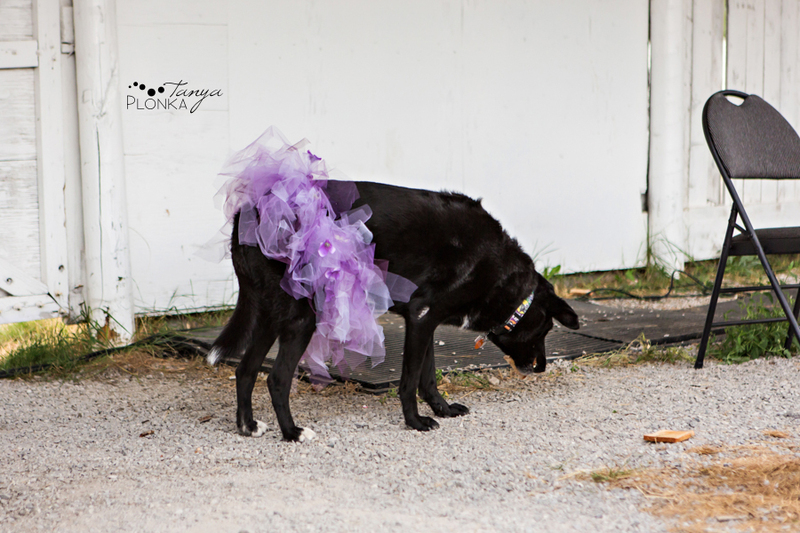 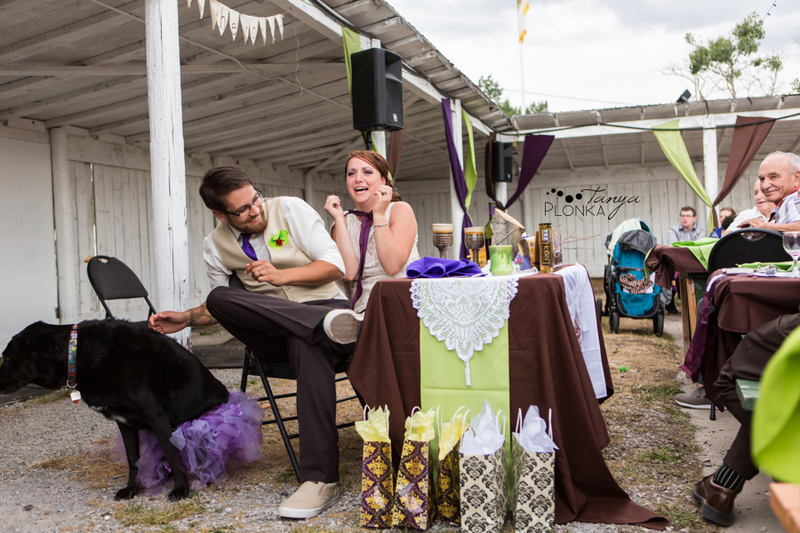 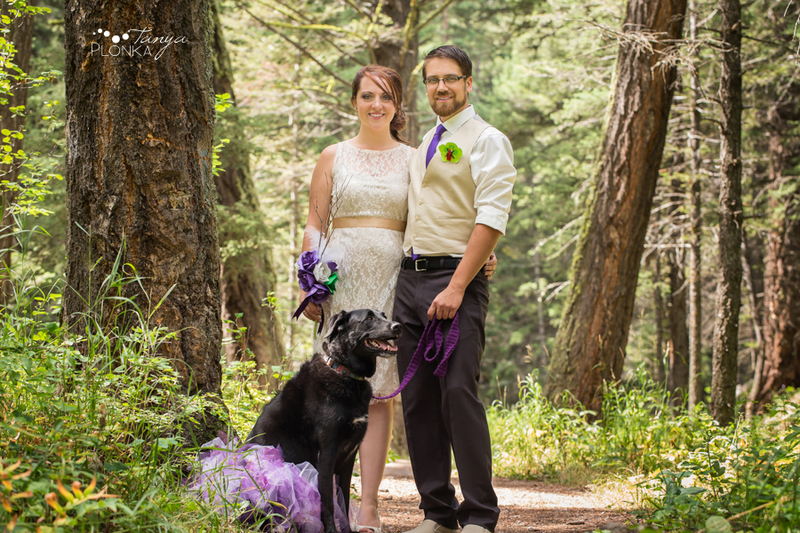 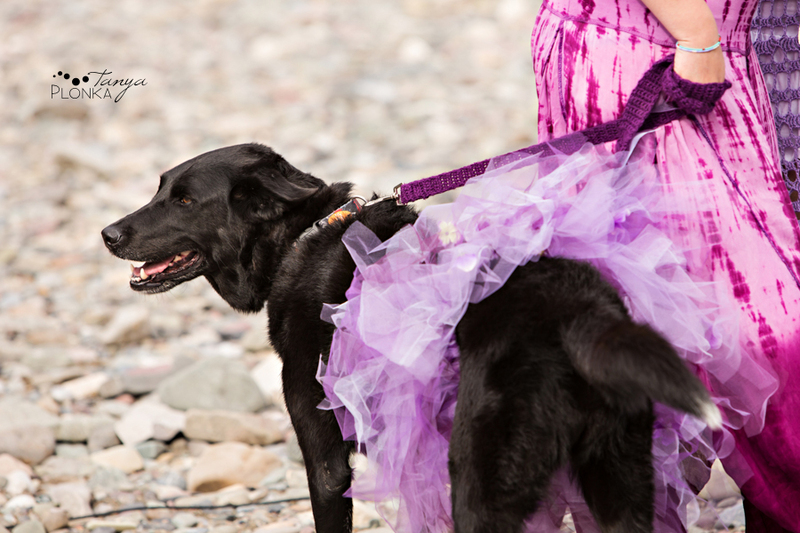 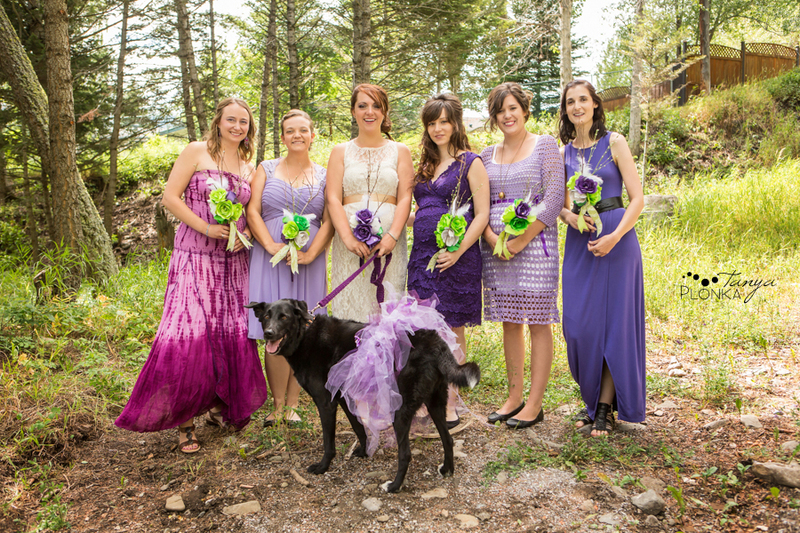 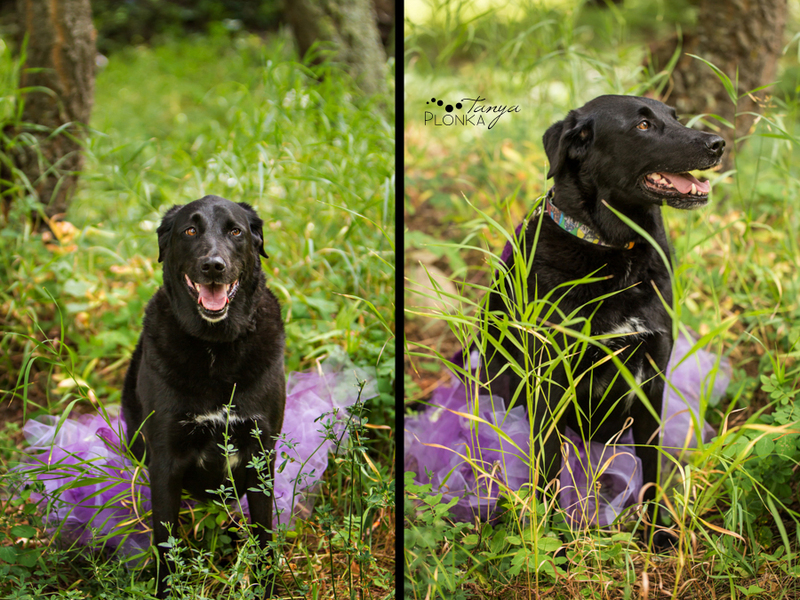 Tricia and Colin’s beautiful dog Athena was their flower girl and she rocked her tutu right to the end of the night! 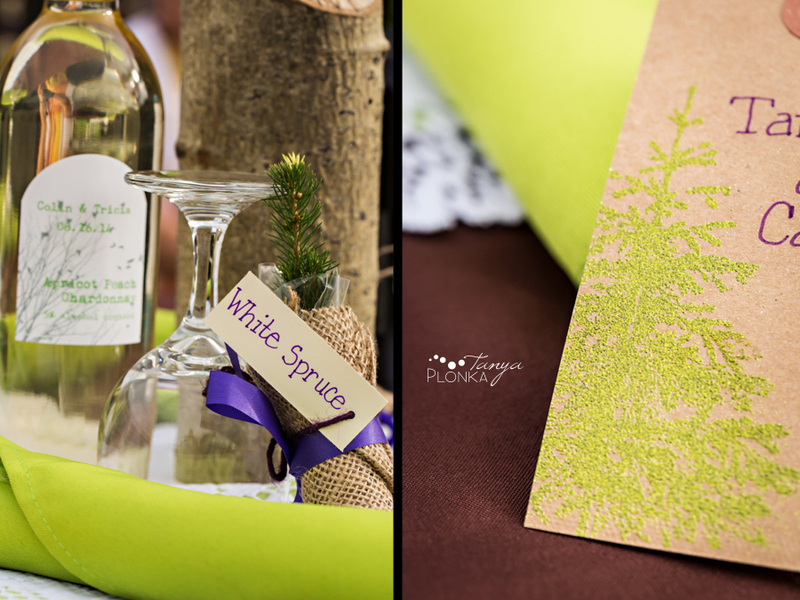 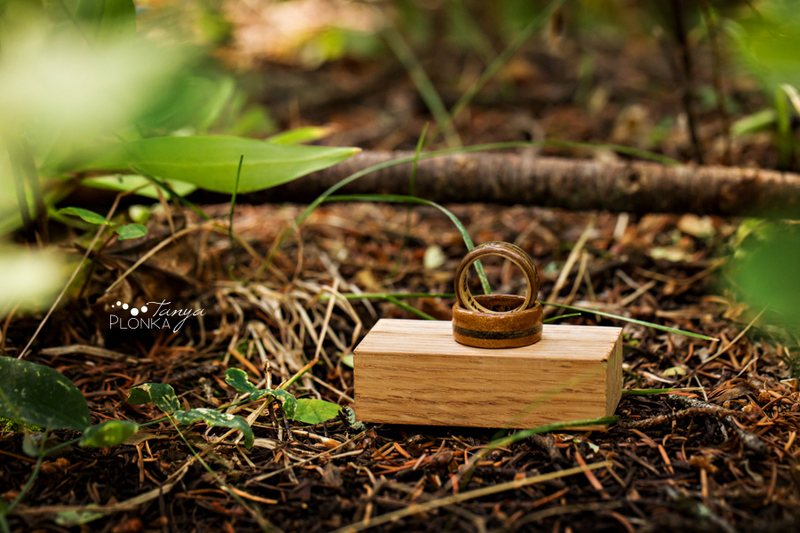 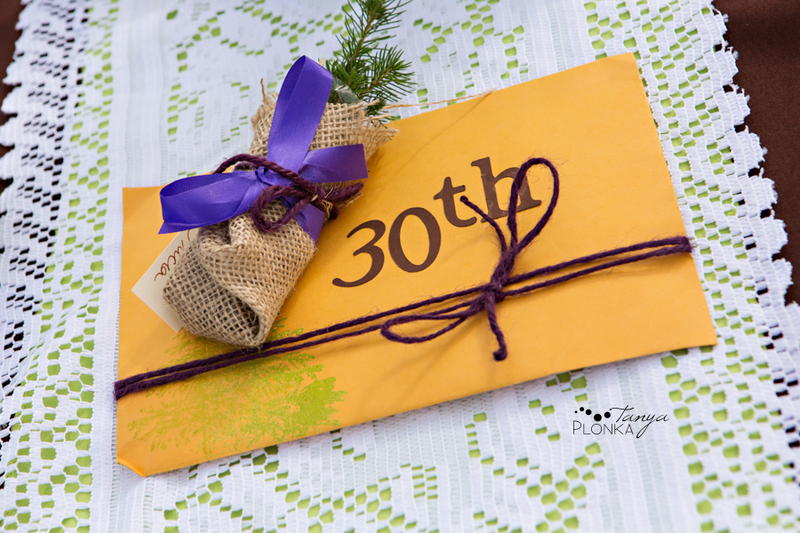 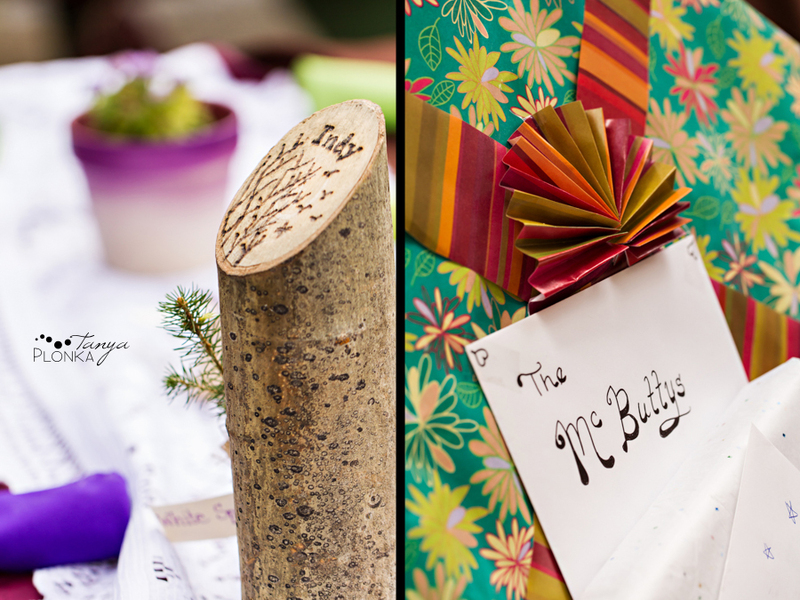 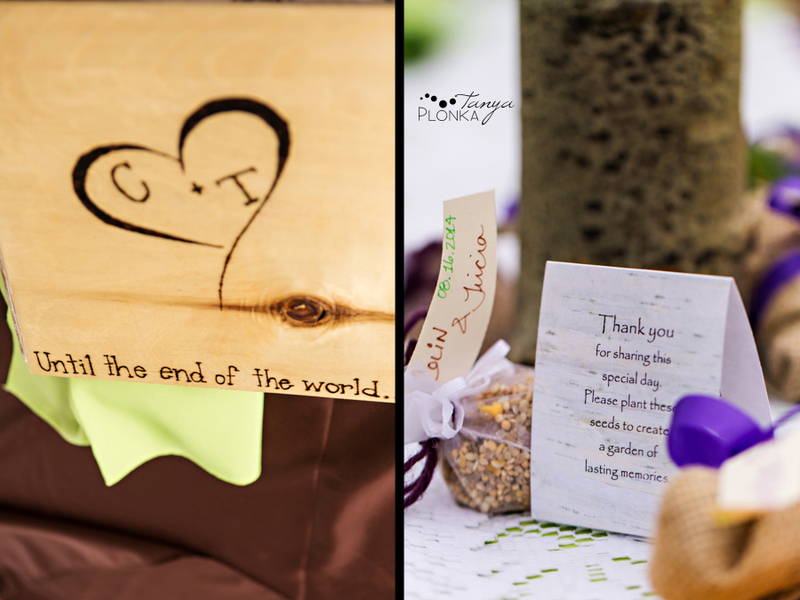 Trees played an important part in their wedding theme, and even their rings were made of wood. 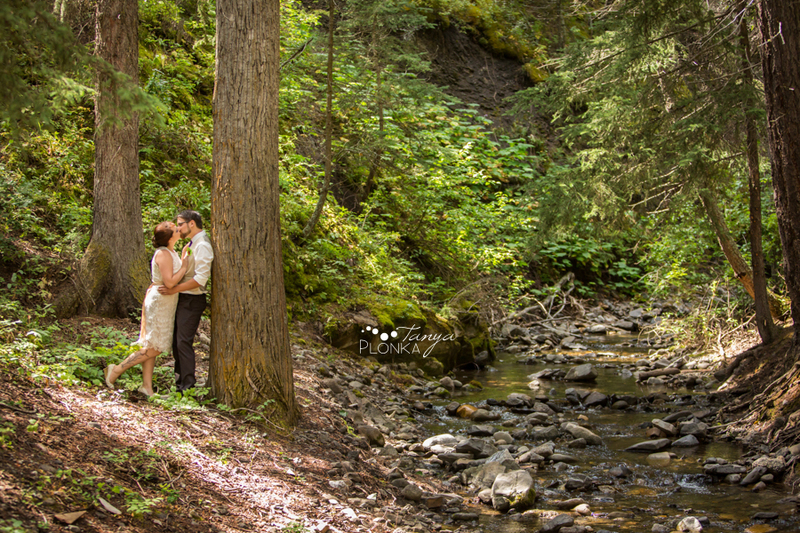 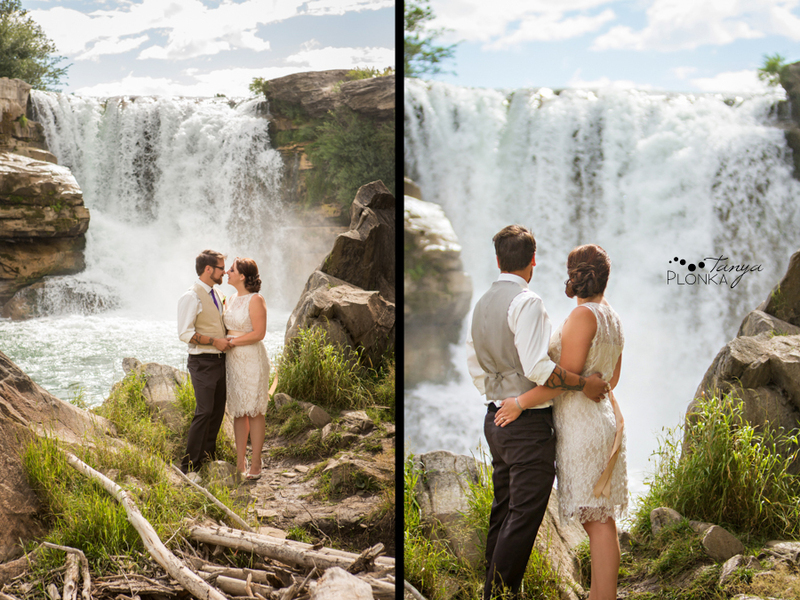 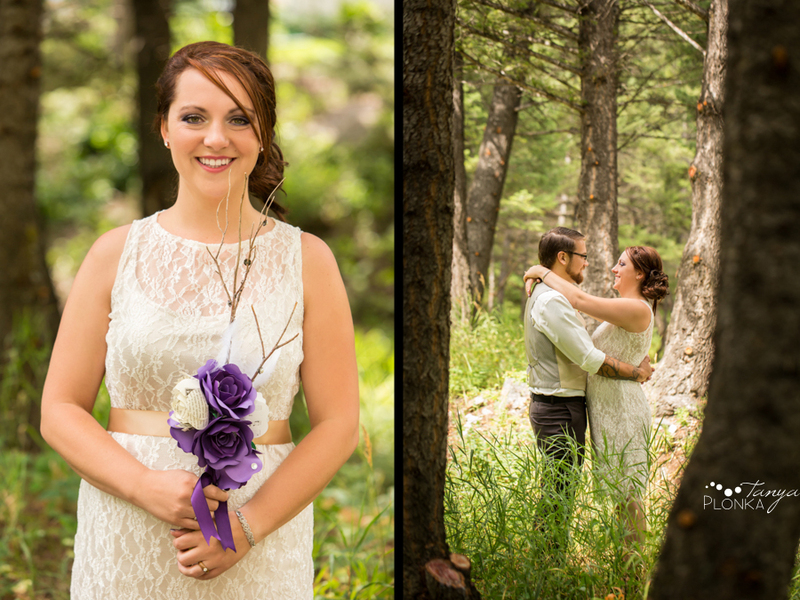 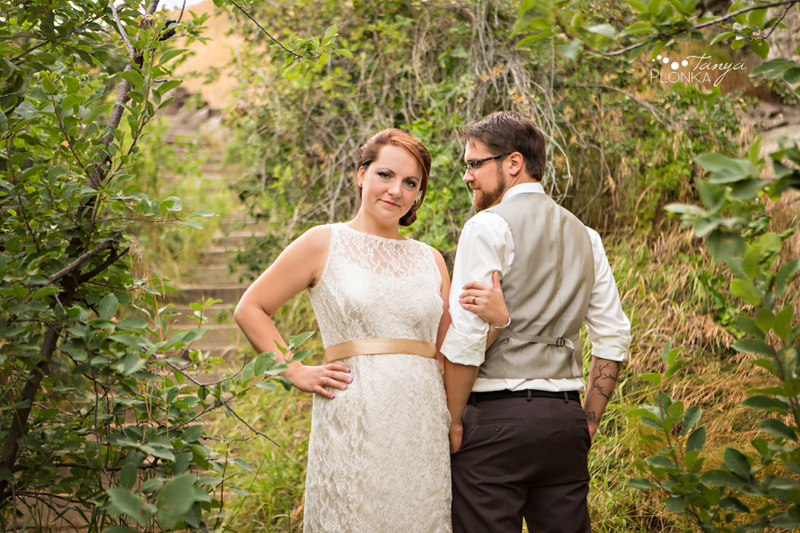 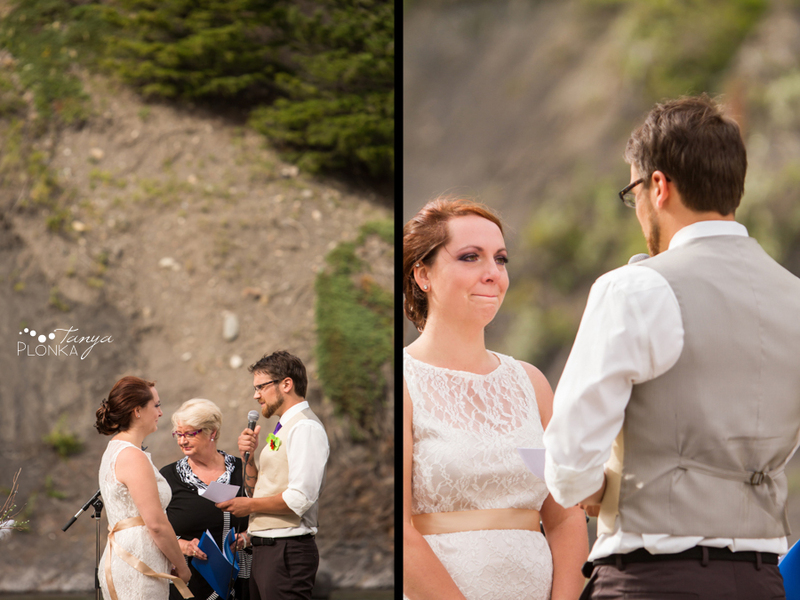 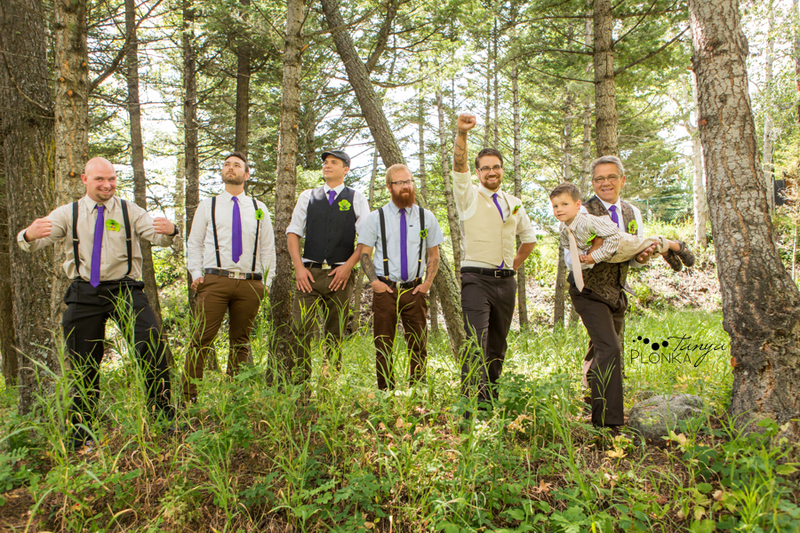 After we finished photos in the Pass, we headed for a few portraits at Lundbreck Falls before their ceremony. 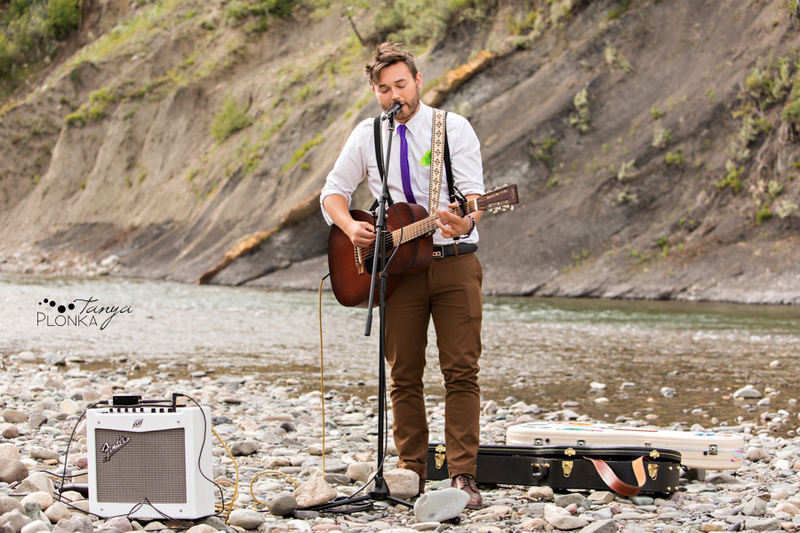 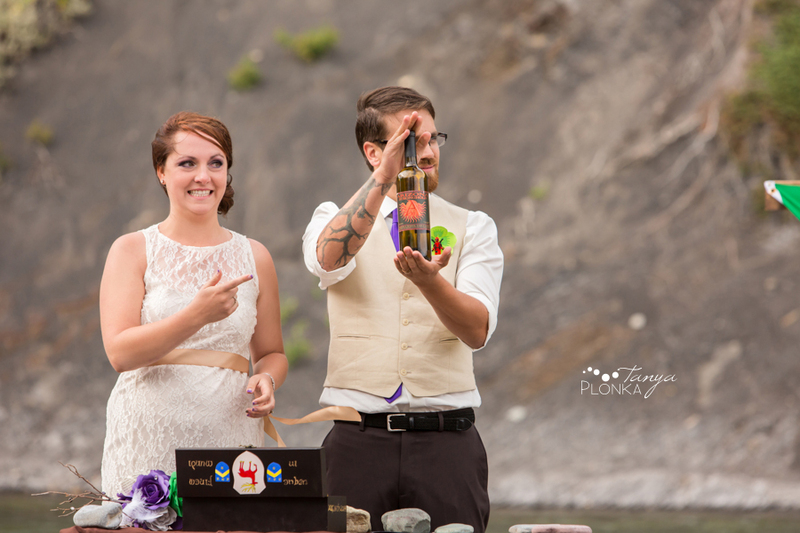 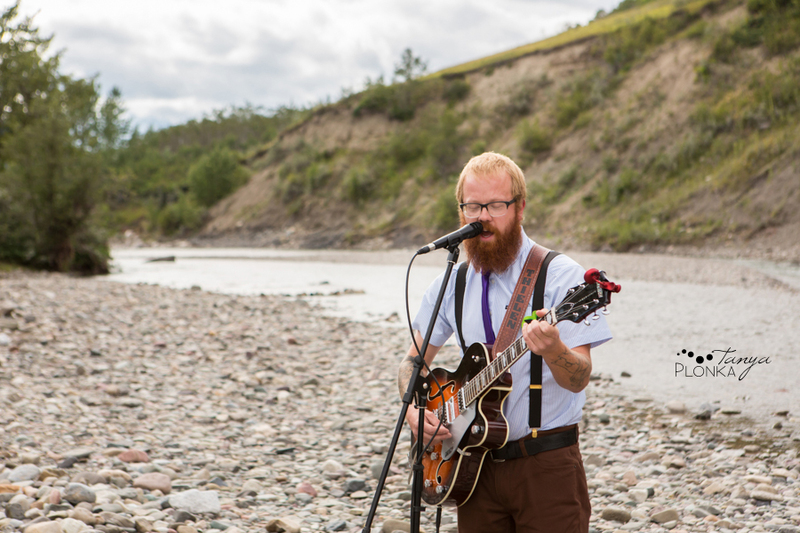 Their ceremony was held on the rocky shore of the Castle River, and Colin’s musician friends provided the soundtrack. 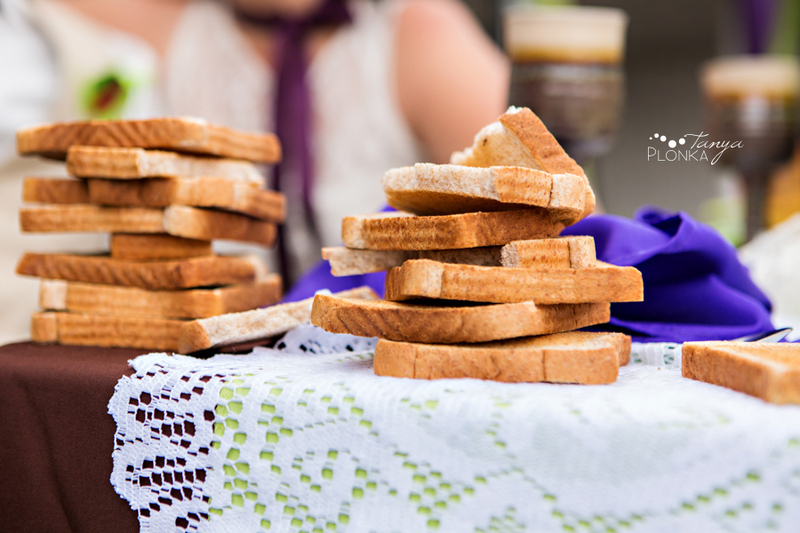 Athena quickly got to work cleaning up the toast! 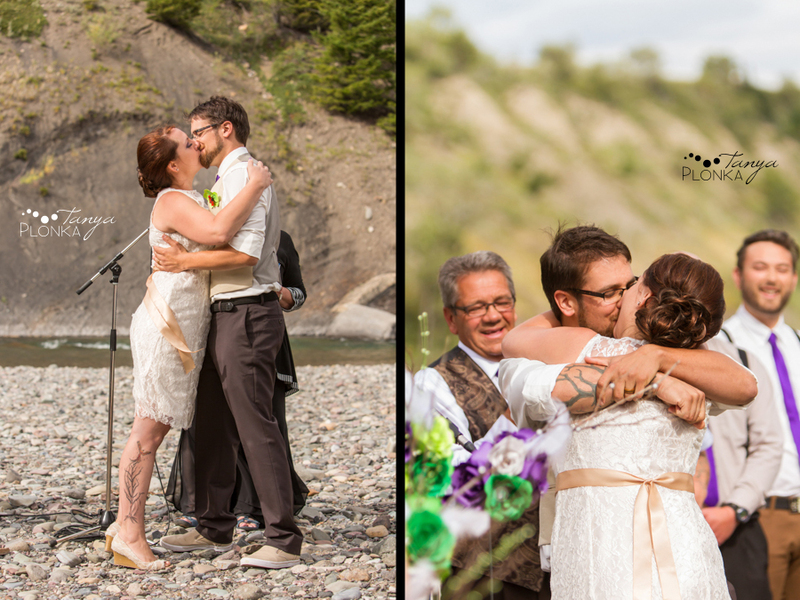 There was no special game involved in getting the bride and groom to kiss, but Tricia and Colin had a system in place to make sure it didn’t happen very often… if you clinked your glass, you got to be up close and awkwardly personal with the kiss! 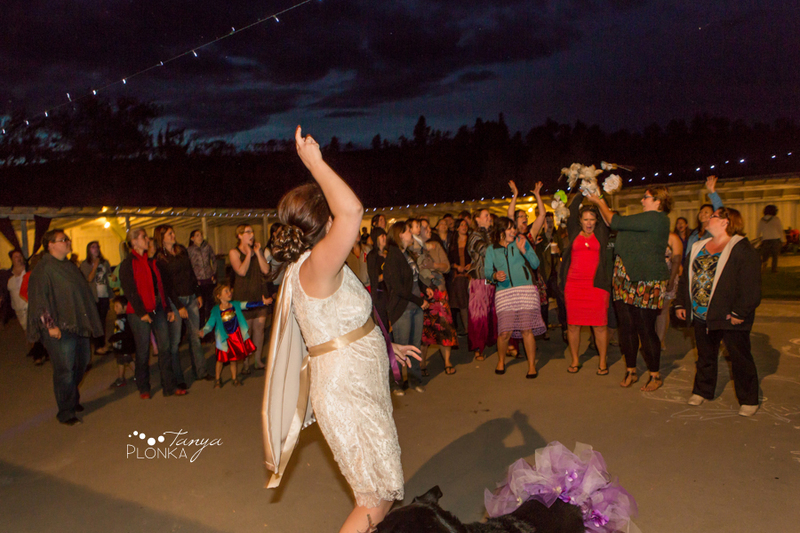 Athena joined in the first dance. 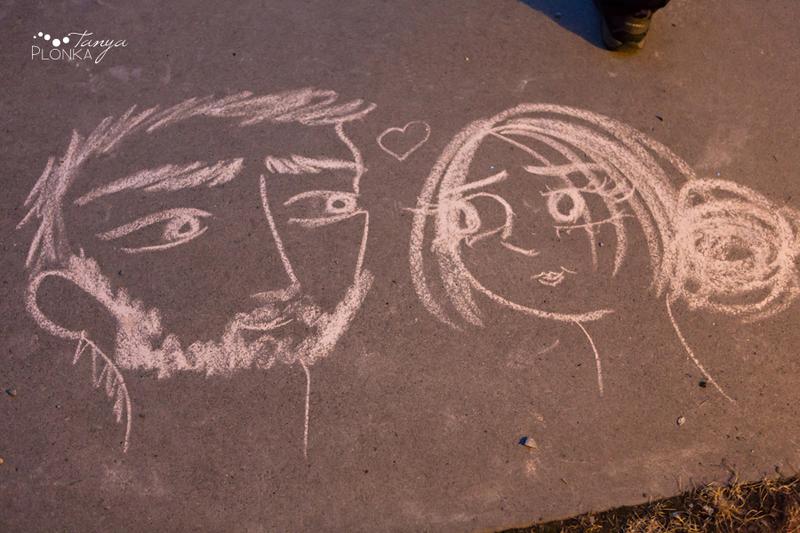 Chalk was provided at the reception and really gorgeous art sprung up all night! 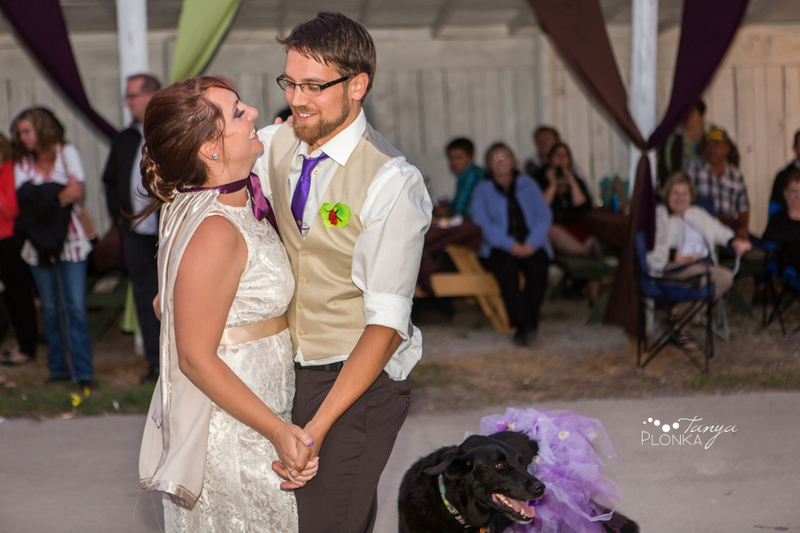 Tricia and Colin had to take a break from their reception to keep their guests safe from a Dementor… or maybe it was a Ringwraith? 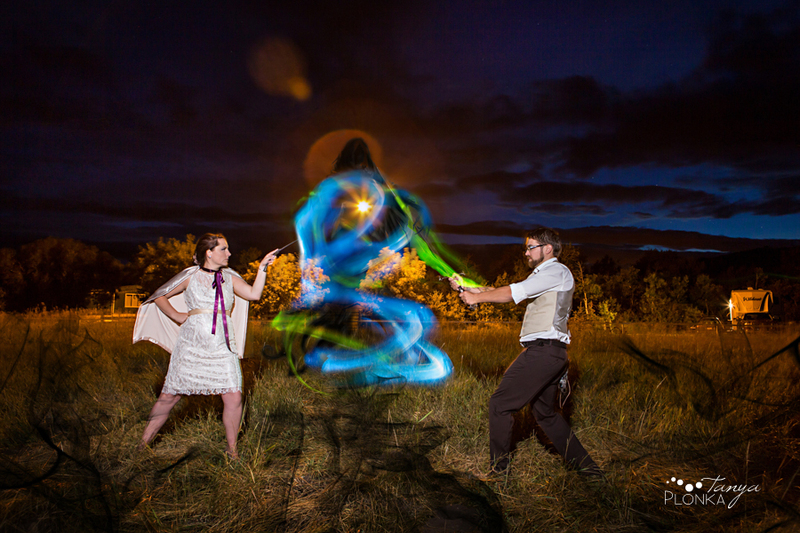 Just to be safe, they used both wizardry and Middle Earth magic to fight the creature!